This website also includes landscapes: coloured pencil drawings as well as etchings & aquatints. (See ‘Links’ for an explanation of the processes of etching and aquatinting.) The drawings are originals, but a few of them are available in print form as well. The etchings & aquatints are printed in limited editions, the maximum of which is 120. 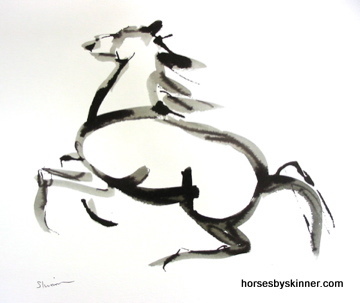 The dimensions of the horse drawings refer to the paper size and are approximate. Dimensions of both the landscape drawings and landscape etchings refer to the image size and are also approximate.